From fake handbags and DVDs, to electronics and even identification cards, the counterfeit industry worldwide raked in a staggering 1.2 trillion dollars in 2017 and is set to grow even more in the next few years. Some might initially dismiss the idea of counterfeit goods being a dangerous menace. But one only has to look at the sobering death toll from fake pharmaceutical drugs — now pegged at about one million people worldwide — to see that it would be crucial to have a reliable way to distinguish authentic items from the fakes. It seems like a daunting problem, but what if consumers could potentially use their smartphones to help them determine whether something is the real deal or not? IBM is now launching what it calls the Crypto Anchor Verifier, which combines artificial intelligence with optical imaging and blockchain technology to verify the authenticity of goods. Here’s how the technology would work: using machine learning techniques, artificial neural networks and video analytics, the Crypto Anchor Verifier is able to evaluate the optical attributes of an object or liquid. Each substance — whether it’s food or a type of material — has its own set of optical patterns, which might include the colors and the saturation of those colors, as well as how it moves and how thick it is, if it is a liquid. Seen with only the naked eye, these various qualities might be difficult for human vision to classify and compare. Typically, such optical characteristics could be analyzed with light spectrometers, but these can be unwieldy to carry and too pricey for the ordinary consumer. In contrast, IBM’s software would leverage the ease-of-use and portability of smartphones and would use machine learning models that have been trained on optical data signatures gleaned from authentic samples, allowing it to more accurately tell the difference between the real thing or a dupe. Capturing the image of the object being scanned can be done with the smartphone’s camera, and certain image-processing techniques are then applied to help better analyze the optical patterns. But it doesn’t end there. In addition, the Crypto Anchor Verifier is anchored to blockchain technology, the same element that underlies cryptocurrencies like Bitcoin. Of course, blockchain technology isn’t restricted to cryptocurrencies; it is now being applied to many different areas that require authentication, from certifying diplomas and resumes, to microgrids trading electricity locally. Since the blockchain records and verifies all sorts of transactions in a kind of decentralized, distributed “digital ledger” that everyone on the network can see, it can also be used to track the movement of merchandise from its point of origin, through supply networks and finally authenticate them at the final destination to ensure that they haven’t been altered. According to IBM, the Verifier could be used in numerous ways, from detecting counterfeit money, to distinguishing whether seeds have been genetically modified or not, to analyzing water quality or detecting the presence of bacteria. The software could also determine the composition of ingredients in a particular substance, or ensure that pharmaceutical drugs are indeed authentic and have not been tampered with in any way, thus potentially preventing needless deaths. 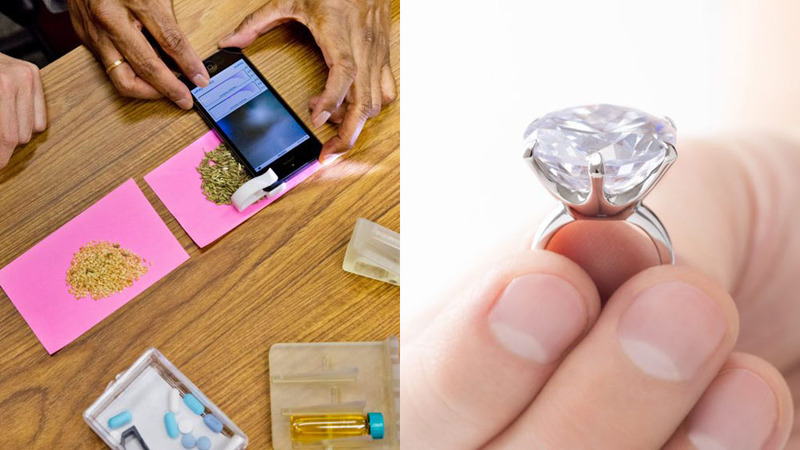 In particular, IBM is partnering up with the Gemological Institute of America (GIA) to test how this new technology will fare in the real-world situation of evaluating and grading diamonds. Right now, current AI models are capable of predicting the grade of a diamond within one grade level, with an accuracy rate of about 90 percent, using two-dimensional images. The aim now is to capture and create three-dimensional model images of diamonds, and then utilizing the Verifier to analyze and grade them — a handy tool that could then be used by both consumers and gem retailers. In addition, records of such products could be then gradually added to the blockchain, creating a repository of reliable information that could be then used over and over — not just for diamonds, but potentially for all sorts of goods that would benefit from authentication.